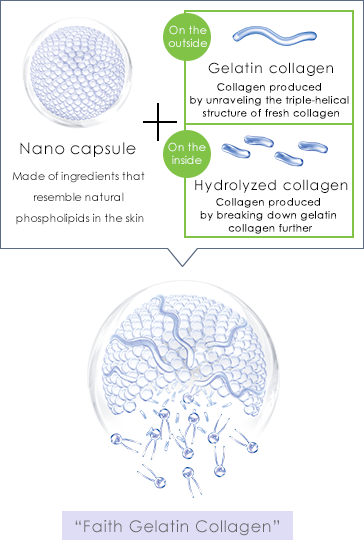 We wrapped fresh collagen (*4) with a triple-helical structure around nano capsules. We then freeze-dried the formulation to maintain freshness. Dissolve the product in the included water before use. Fresh collagen with a triple-helical structure has about 600 times greater water retention capacity (*5) than hydrolyzed collagen. This approach allows collagen that does not ordinarily enter the skin to penetrate to the stratum corneum. This technology, the first of its kind in the world (*1), has caused the conventional wisdom about skincare to be rewritten. In conventional skincare, the basic approach was to moisturize and protect the surface of the skin with oil contained in products such as emulsifiers. 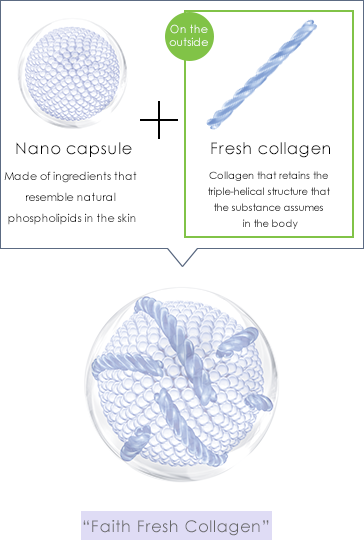 The Stratum Corneum Lamellar Beauty Method being promoted by the Faith Group is distinguished by the fact that collagen penetrates into the skin (*8) and the fact that nano capsules become part of the skin, moisturizing and protecting the stratum corneum, which is the key to beautiful skin. “Faith Fresh Collagen” and “Faith Gelatin Collagen” not only protect the skin, but also become part of it. By maintaining the lamellar structure (*9) in the stratum corneum, this unique approach to skincare leads the way to healthy skin. The technology underlying the Stratum Corneum Lamellar Beauty Method has been patented in Japan, Taiwan, the U.S., the E.U., China, and South Korea. This technology makes possible skincare results that only the Faith Group can deliver to women around the world. 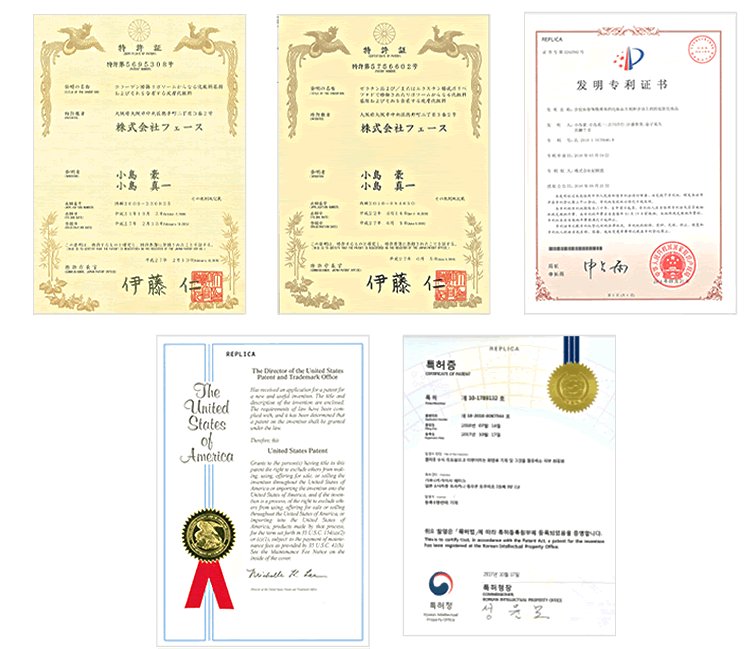 The Faith Group received patents in Japan for “Faith Fresh Collagen” and “Faith Gelatin Collagen” in February and June 2015, respectively. Subsequently, Group has received patents for “Faith Fresh Collagen” in Taiwan, the U.S., the E.U., China, and South Korea. Since its founding, the Faith Group has followed its commitment to the principle that cosmetics used by women throughout their lives must deliver skincare results by truly beautifying the skin. We believe that cosmetic technology that we proudly developed as the first of its kind in the world (*1) and that has been granted patents in various countries is the foundation that allows us to bring the Stratum Corneum Lamellar Beauty Method to women around the world with pride. The Faith Group utilizes three channel brands to deliver “Faith Fresh Collagen” and “Faith Gelatin Collagen” to all women who are serious about becoming beautiful.